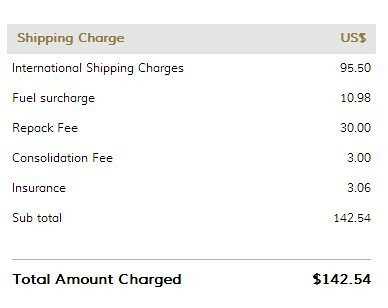 Based on above 2 screenshots, Comgateway seem to be the one charging cheaper rate, around $20 cheaper for 12kg of shipment. Nonetheless, my recent shipment of 12kg using Comgateway (pictured below) has substantial consolidation fee and repack fee due to it being 6 packages and some of it are in big boxes. So far i could not find the consolidation fee and repack fee for Borderlinx, anyone have idea? As for duty charges, i think Borderlinx charge excessively and not even sure it cover the duty tax incurred in Malaysia custom. As per my comgateway shipment below, no taxes incurred during payment time in their website, tax is only quantified once reaching Malaysia custom to be around RM130 for my shipment. 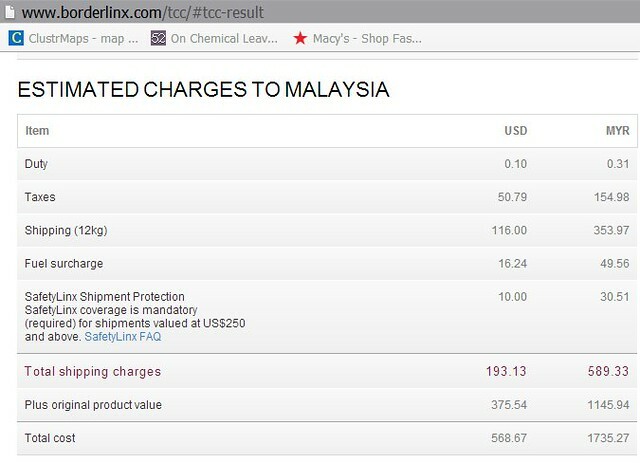 And sometimes my shipment won’t even incurred duty by Malaysia custom, so i wonder why should Borderlinx charge the taxes all inclusive at the initial stage. My shipment above is for 12kg of items value over US$300 was charged by custom Malaysia for about RM130 duty tax. Comgateway DHL paid for the duty tax on my behalf as they provide door to door service without me having to collect the items from Subang airport. As per online research, there is some words on if the item value + shipping charge (converted to MYR) is less than RM500, then it would not be charged duty in custom. From past experience, i mostly shipped items+shipping totaled RM500 and less, therefore had not been charged duty before this, thus they might be some truth in that statement. Anyone have personal experience of using Borderlinx or other services to ship items to Malaysia? I find viabox to be cheaper.